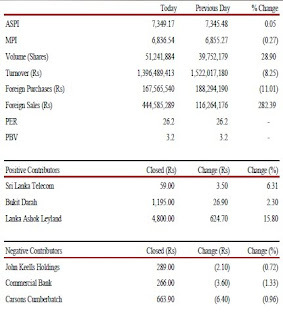 Colombo stocks Indices were mostly stagnant. However, Milanka Price Index (MPI) closed in red as blue chip stocks failed to appreciate amidst dull investor participation. The All Share Price Index (ASPI) was only just changed, 0.05% rising by 3.69 points and closing at 7,349.17 and the Milanka Price Index (MPI) dipped 0.27% 18.73 points closing at 6,836.54 during the day. Market turnover was at Rs.1.39 billion (dropped 8.25%) with a volume of 51.24 million shares changing hands (topped 28.9%). Foreign purchases dropped 11.01% to Rs.167.5 million and foreign sales topped 282.39% to Rs.444.58 million. Price to forward Earnings remained stable at 26.2 times. The Bank, Finance and Insurance sector was the main contributor to the market turnover due to Commercial Bank (COMB) with the sector index increasing 1.12%. Commercial Bank (COMB) made the highest contribution to the market turnover with two crossings of 1,401,402 shares at Rs.270. The share price increased by Rs.3.60 (1.33%) and closed at Rs.266. Foreign holding of the company decreased by 1,000,000 shares. The Diversified sector also contributed to the market turnover with sector index decreasing 0.61%. Aitken Spence Hotel Holdings (AHUN) bought 30,600 shares of Browns Beach Hotels (BBH) for Rs.646,660. Subsidiaries of Bukit Darah (BUKI) and Carsons Cumberbatch (CARS) made dividend announcements including Selinsing (SELI) at Rs.20.60 per share, Indo Malay (INDO) at Rs.10.60 per share and Good Hope (GOOD) at Rs.14.05 per share and Shalimar (Malay) (SHAL) at Rs.14.00 per share.